Apex is a suburb of Frobisher Bay (Iqaluit). The only record of scouting activities was in 1978 when the Apex scouting community requested the name change on the Northern Interpreter badges from "I speak Eskimo" to "I speak Inuktitut". Frequently called "the iceberg capital of the North," Qikiqtarjuaq sits off the coast of Baffin Island some 96 kilometres north of the Arctic Circle. Qikiqtarjuaq (which just changed its name from Broughton Island in late 1998), means "big island" in Inuktitut, even though the island that the community calls home is only about 16 kilometres long and 12 kilometres wide. In 1955, construction began on a DEW Line site at Qikiqtarjuaq, attracting Inuit from Clyde River, Pangnirtung, Kivitoo and Padloping Island, who came to find employment. A Hudson's Bay Co. store was established three years later and by 1968, the federal Department of Indian Affairs and Northern Development had relocated residents from Kivitoo and Padloping Island to Qikiqtarjuaq. On Aug. 31, 1979, Qikiqtarjuaq obtained hamlet status. The community has been actively involved in scouting activities since the 1970's. 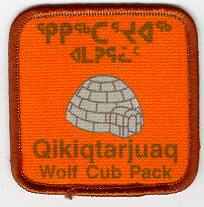 Qikiqtarjuaq Cub Oolana Nuqingaq designed their first Group badge in 1999. As the end of the Scouting year was fast approaching, with no sign of the new badges, the badge manufacturer was contacted. It was discovered that the badge design had been lost in the mail. After receiving a replacement copy of the badge design, a limited run of 50 printed badges was done up by the badge manufacturer and couriered out to Qikiqtarjuaq. The badges arrived the morning of the last meeting and the cubs were ecstatic to receive their first community Scout badge. The remainder of the order was sent to the Scout Shop in Yellowknife and consisted of the fully embroidered version. The community is now out of the printed badges and the embroidered badges are the current issue. 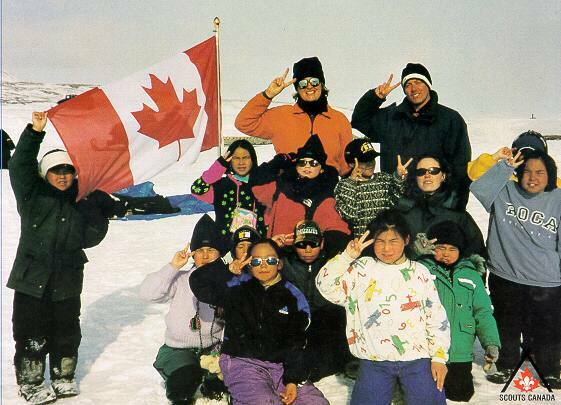 In June 2001, 6 Cubs and 2 Leaders attended the 1st NWT and Nunavut Cuboree in Yellowknife. No known scouting activities, past or present. The town of Tungsten in the NWT is only accessible by air or by road through the Yukon. It was a small community serving as the residences for employees of the Canadian Tungsten Mining Corporation in it's Cantung Mine. Cantung was in production from 1962 to 1986 when depressed tungsten prices caused the mine's closure. Although the town closed along with the mine, caretakers were on site and the townsite was preserved with the view to it's eventual re-opening. Tungsten was part of the Great Slave Region and had registered members from 1978 - 1981 and 1985 - 1986. The mine re-opened in 2001 under the ownership of American Tungsten Corp. Ltd. The townsite is still in existence, but it is unlikely to become a family oriented community and having any Scouting participation again due to it being a fly-in operation.